Also, did you go above and beyond for Lemonade Day? We will select one Lemonade Stand owner for the Sauk Valley Entrepreneur of the Year. This person excelled at the entire process of Lemonade Day, had a successful stand which resulted in meeting their goals and experiences. Share your story when you're completing the business results form (the link above) to be considered. Submissions due by September 1st, 2018. The Local Sauk Valley Entrepreneur of the Year will be entered to win the National award. The 2018 National Youth Entrepreneur of the Year will be rewarded with a trip to a major theme park! These are the 2 bikes we're giving away! 8/12/18 - Lemonade Day "Best Of" Results are in! Votes were tallied off the Local Explorer app. Next year we will open voting up to Facebook, the app & text message voting! Congrats to the winner, here are the top (4). We will message you details on Monday about how to pick up your plaque! 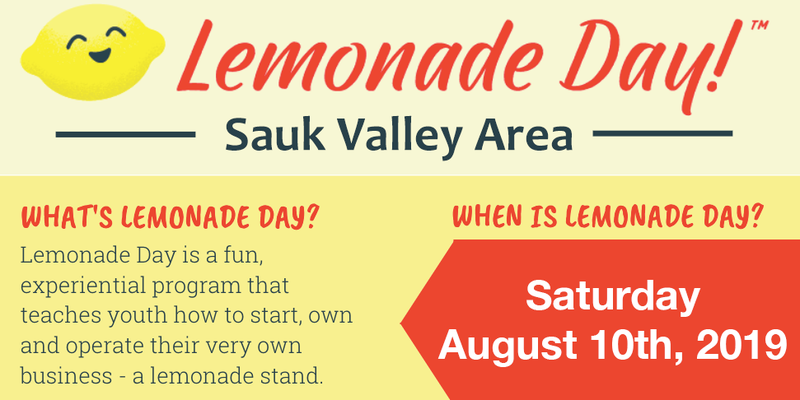 8/11/18 - Lemonade Day in the Sauk Valley is today! Get out and support our young business owners! Buy Lemonade and Vote on Best Tasting and Best Stand right on the App! Look under Stand Map! 8/1/18 - We are so excited for August 11th , we can hardly wait! We hope that you are all as excited as we are, so we jotted down some FAQ’s to help you. 1. Brand your stand and put your pin on the map! We have lots of kids registered but not everyone has put a pin on the map. I know this can sometimes be a hard or difficult decision, but it won’t work as well for you if we can’t tell people how to find you. LOCATION, LOCATION, LOCATION! If you have issues or problems mapping your location, please let us know. Still don't know where to put your stand? Let us know, we have official Lemonade Day Location Sponsors with OPENINGS! 2. A friendly reminder from the Health Department. Because this is a public event only lemonade can be served. If you want to serve anything besides lemonade you will need to contact your local health department and apply for a temporary permit for a small fee. If you're stand is located in Whiteside Co. (Sterling/Rock Falls) you must download and complete the following One Day Lemonade Stand Permit Application - No Fee. Please complete this ASAP and submit! If you're stand is in Ogle Co. (Oregon) please review this material. Emails will be sent out as soon as possible with your local health department requirements and regulations. 3. Stand Profiles for the Mobile App!! Name your stand - make it something catchy and cool that people can remember and will want to visit. Send us a picture of your stand – This will make it easy for people to vote for your stand online. Your Name - with all the cool stand names out there, don’t forget to tell us who you are! SBDC Classes have started! Don't worry, there's still two left. The Illinois Small Business Development Center is offering a FREE one-hour consultation with any child/mentor combination to help walk you through your backpack & materials, that information will be available in the packet. Don’t miss out on these great learning opportunities, please email sbdc@svcc.edu. Are you just getting registered? If you haven't, do it here! Remember: This is a family event, relax, enjoy, learn and most of all have fun! Don't forget to download the Local Explorer App - this will have all the latest Lemonade Day information !